With the end of the year rapidly approaching, here are some tips to help you feel like you’re going into the holiday season with your house in order. 1 – Make sure you’ve used up all of your credit cards’ annual travel credits. Many premium travel cards, such as the Citi Prestige, American Express Platinum, and Chase Sapphire Reserve have annual travel credits that have to be used before the end of the year. Review your account history to make sure you’ve redeemed those credits – otherwise you’re leaving money on the table. Those travel credits help reduce the pain of those cards’ high annual fees. 2 – Double check your elite status qualification for airline and hotel programs. Now’s a good time to review your elite qualifying trackers and make sure you’re where you expect to be – if you have a flight or hotel stay missing from your account history, file a missing credit request to make sure it gets resolved before the end of the year. And if you’re close to qualifying for the next tier with a program, it’s not too late to get in a quick mileage run or mattress run, or rack up some spend if you have a credit card that offers elite qualifying miles or dollars at certain spending thresholds. 3 – Review credit card spend towards annual bonuses. Many credit cards offer special perks for large amounts of spend – for example, the American Airlines Aviator Red MasterCard from Barclaycard has a $100 voucher if you spend $30,000 in a calendar year. Also, the Ritz-Carlton Visa Infinite card from Chase offers Marriott Platinum status if you spend $75,000 during your “account anniversary year” which means the year beginning with your account open date through the anniversary of your account open date, and each 12 months after that. If you had large purchases on one or more cards this year, it’s worth checking to see if you’re close to a spending threshold where it might make sense to spend a bit more on that card before the end of the year. 4 – Check your (and your family member’s) passport and Global Entry/TSA PreCheck expiration dates, especially if you have international travel planned soon. Many countries require that your passport have at least six months of validity beyond the dates of your trip. If you find that you or someone in your family has an expiring or expired passport, reach out to your nearest passport agency to see about getting it renewed – depending on your travel dates, next-day or even same-day service may be available for a fee. For Global Entry and TSA PreCheck, you can start the renewal process up to a year before your card expires, so now may be a good time to get an appointment on the calendar if you need an interview – some enrollment centers get booked up weeks or months in advance! (But remember, if you’ve been conditionally approved, you can take care of your interview when re-entering the country after your next overseas trip (Details here). 5 – Start planning 2018 holiday travel. Most airlines allow award bookings around 330 days in advance, so you’ll soon be able to make reservations for Thanksgiving 2018 travel, and you can already book for other major holidays and travel periods earlier in the year. If you know when you and/or your family will be free next year, planning ahead and getting some reservations confirmed can save you some serious miles or cash.– plus it will get you better seating choice and the flight times that you really want. 6 – Watch for end-of-year sales and promotions. Many websites will offer special deals in the next few weeks, like 12 days of discounted gift cards with the Swych app, TopCashBack’s Xmas Treats giveaway, and the Starbucks for Life contest. Taking advantage of these promotions can be an easy way to rack up some extra miles or savings. And remember this, too: Relax, be kind to people, and enjoy the company of family and friends. Whether you’re spending the holidays at home or on the other side of the world, take some time to enjoy the company of whomever you’re with and extend some grace and kindness to those around you. 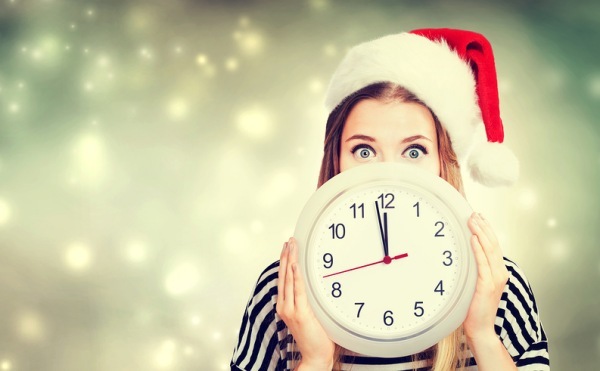 The holidays can be a stressful time of year for retail workers, airline and hotel employees, TSA screeners, infrequent travelers, and everyone else, so a smile and a bit of patience can go a long way.